Encourage feedback: Rather than only posting links, ask for opinions from your fans. Take a poll using Facebook Questions. Run a photo caption contest. Choose relevant and compelling content: This may seem elementary, but remember the audience you’re trying to reach. If it’s current students, provide campus news and bring up common milestones (the Beanpot; the end of finals; a department-wide social event). Check your Facebook Insights regularly to see which pieces of content are getting the most feedback. Patterns here may inform your decisions as you go. 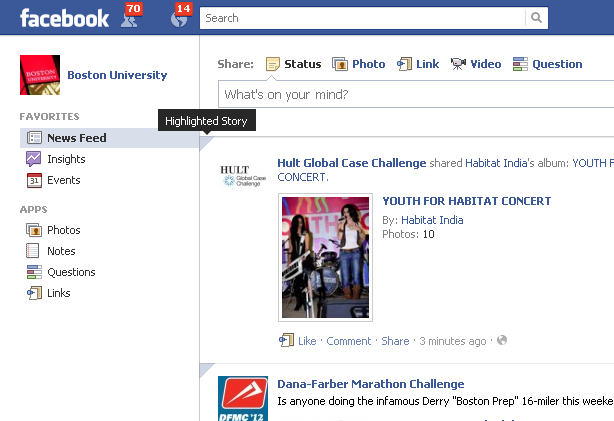 Encourage visits to your Facebook page elsewhere: Do you have sharing functionality built into your website? Are you promoting your Facebook page through your more traditional marketing channels? How have you been promoting activity on your Facebook page? What i don’t realize is in fact how you are now not really a lot more smartly-liked than you may be right now. You’re so intelligent. You already know thus significantly with regards to this subject, produced me for my part imagine it from so many numerous angles. I encountered this same sort of problem on the news feed of a Facebook page of a website I manage. Frankly speaking, I think it all boils down to the sort of contacts and fan friends you have on the page. I will put into effect your three suggestions on how to ensure that fans stay active. I enjoy reading through methods fascinating copy writers.